Add a fitted UK Plug? 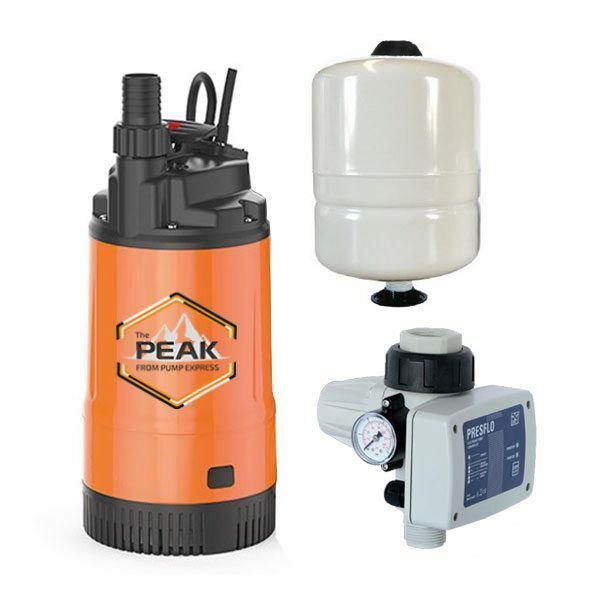 The Peak is the most versatile Bundle for well water recycling applications. The Bundle has numerous uses in domestic and commercial applications where free water is harnessed for irrigation, vehicle washing, toilet flushing and much more. For irrigation purposes when watering from a well this pump is designed for use in larger gardens. With correct filtration and UV sterilisation it can be used drinking purposes. – Submersible multi-stage well pump – For domestic used supplying water from reservoirs tanks, or wells. – Pressure sensing fixed speed pump controller – Automatically starts and stops the pump. Features Dry Run Protection & Auto Reset. – Three-way brass connector fitting – with 1″ Gas Connections, to connect the pressure vessel in the system, before the first draw off. We recommend including a 1 1/4” Non-return valve with the Peak Bundle. For a typical installation example, please click tab above. F Range – Flanged High Flow Pumps – The high efficiency and continuous duty capabilities make these pumps ideal for use in industrial applications. HF Centrifugal Pump – High Flow – The high efficiency and continuous duty capabilities make these pumps ideal for use in industrial applications. CR Horizontal Multistage Centrifugal Pumps – These quiet pumps are widely used in domestic applications including water pressure boosting. MS 06 Multistage Centrifugal Pumps are suitable for domestic applications including water supplies (as a pressure set), garden irrigation, etc. HF Centrifugal Pump – Medium Flow – The high efficiency and continuous duty capabilities make these pumps ideal for use in industrial applications.